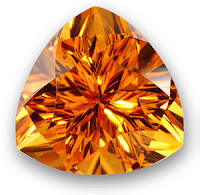 Welcome to Part 3 of our “Gemstones of the Zodiac” series. The third sign of the Zodiac is Gemini (May 21 -June 20). The Mystical Zodiac stone for Gemini is Amethyst. 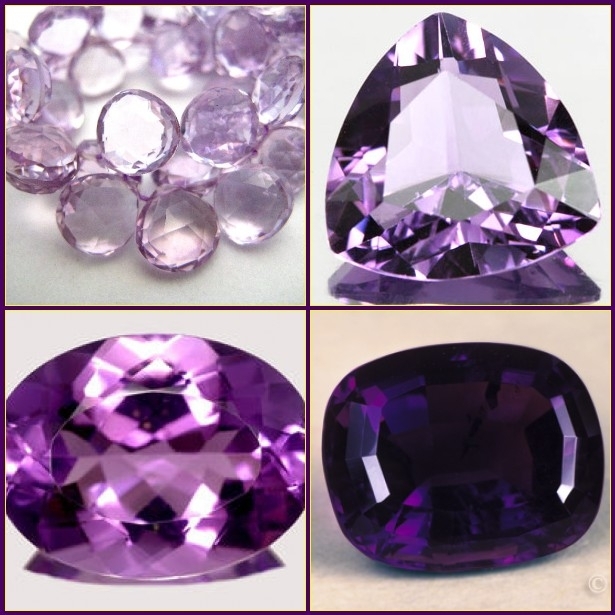 The word amethyst is derived from the Greek word “amethystus”, which means “sober”. Ancient Romans actually crushed amethyst as a way to ward off intoxication. 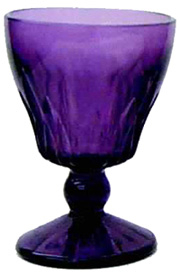 Ancient Greeks believed that drinking from a goblet carved out of amethyst would prevent you from getting intoxicated. Both Greek and Roman lore have a similar story of how amethyst got its name. According to Roman legend, Bacchus, the god of wine, had been insulted by a mortal, and vowed that he would unleash his sacred tigers on the next mortal he passed. That mortal was a maiden named Amethysta. In order to protect her from Bacchus’ tigers, the goddess Diana turned her into a quartz statue. Upon seeing this, Bacchus was so remorseful that he wept tears of wine over the maiden. The grapes from the wine turned the statue of Amethysta purple. And thus was amethyst born. The Egyptians used amethyst as a talisman. Soldiers wore it into battle to help them stay calm during battle. In ancient times, amethyst was often used in rosaries. It was thought to have a soothing presence, and bring calm to the person, as they prayed on the rosary in hard times. St.Valentine was said to have always worn amethyst. In the Middle Ages, if a knight presented his lady with an amethyst, then the pair would be blessed with good fortune and earthly happiness for the rest of their lives. 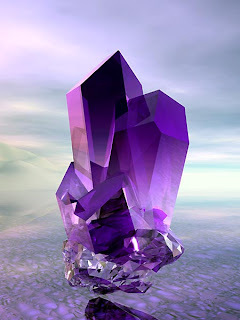 Amethyst is a quartz, and its color comes from trace amounts of iron. A tiny trace of iron, as small as the head of a pin, or smaller, can color an entire cubic foot of amethyst. Its natural color runs from a pale lilac to a vibrant purple. The color can change, however, if exposed to too much heat. If heated too intensely, amethyst will turn yellow. This yellowed amethyst is what we know as Citrine. 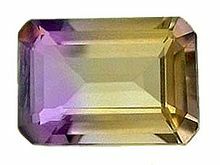 On those occasions when there are deposits of the amethyst and citrine banded together, we get the stone known as Ametrine. 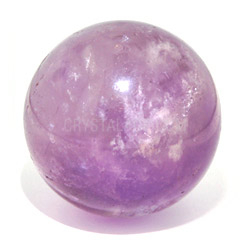 Emotionally, amethyst is a very calming, peaceful, meditative stone. It helps provide calm, balance and peace. It can also help with grief and other personal losses. As a result, it can be used to help rid the body of addictions and compulsions, returning it to a more balanced, peaceful state. Spiritually, amethyst can help increase intuition and psychic powers. It does this by creating a calm, balanced center, which can then attune itself to other planes. This makes it a good stone for meditation and lucid dreaming. While it assists you in reaching into other realms, it will also protect you from others trying to do psychic harm while you are doing this meditative, psychic work. Physically, amethyst can help with headaches, as it helps cleanse the mind. It is also used to help with arthritic, insomnia, pain relief, and phobias. Some also believe it can used during pregnancy to help prevent miscarriages. Amethyst needs to be cleansed every 15 days, together with rock crystal and sapphires. Pretty good post. I just came across your site and wanted to say that I have truly loved reading through your blog posts.